Do you send invoices to the same customers every month? ZipBooks will send your customer an invoice automatically on the day you need it to go out. Customize it to your specifications, make changes when you need to, and skip the monotony of entering the same info every time. If you already know what days your bills need to go out, set up future payments in ZipBooks, and then forget about them. We’ll send your invoices out promptly, with any one-time or recurring changes you choose. You can even use dynamic variables to automatically pull customer information into the correct fields. Customers like to know that you’ve received their payments. ZipBooks will automatically send them a receipt when you receive their payment. 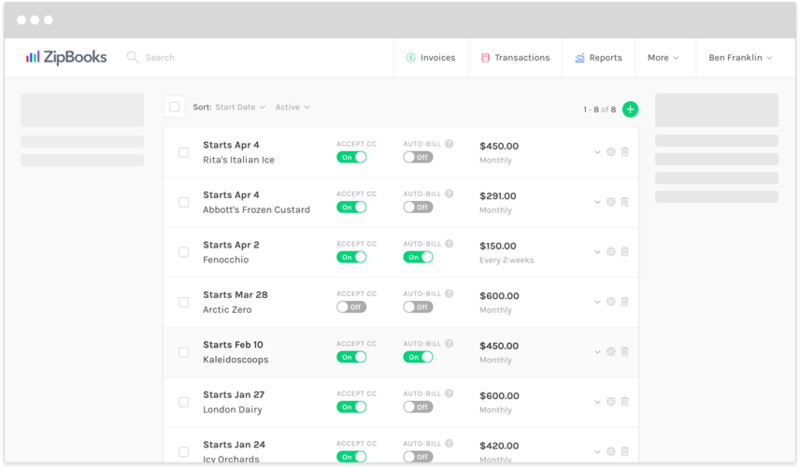 Set your recurring profile to auto-bill, and you can choose to send your customer whatever they would like to see every month: the invoice itself, a receipt for the amount they were billed, or both. Simply use the slider buttons to turn these features on or off, and ZipBooks will take it from there! Use ZipBooks to bill customer credit cards automatically every month, and take the hassle out of entering the info every time. We store credit card info securely so that you don’t have to worry about keeping it in a safe place. When you set up a Recurring Profile on your ZipBooks account, you can do a whole lot more than just bill for one amount every month. For each line item that you add to your invoice, you can specify a period of time for that item to be in effect. Set charges to bill only for a few months, add a price increase several months from now, or set a discount to apply for a certain amount of time. Set up the details once, and then forget about them, and let ZipBooks do the work!